Premiered March 11-12, 2017 | Reva and David Logan Center for the Arts. Presented as part of the Department of Cultural Affairs and Special Events (DCASE) fourth annual OnEdge experimental live performance series. The Three Matadores is the name we have given to a complete micro-play that appears embedded in the book-length poem The Presentable Art of Reading Absence (Dalkey Archive Press, 2008) by American poet Jay Wright. Like much of Wright’s writing for the theater, this play has never been staged. We will attempt a staging that presents all the words exactly as written, including a bracketing selection of the poetry. We selected this passage for several reasons. Its choreography, alternating between mathematical permutations of patterns and movements derived from bullfighting maneuvers, seems particularly suited to our company’s esthetic, and its language in a similar way alternates between the speech of the matadors and the voice of the poetry. The text’s bilingual nature (English and Spanish) appeals to our mission as an international company. Furthermore, it seems to offer a perfect microcosm of Wright’s writing, presented in theatrical, textual, and temporal terms. The Three Matadores micro-play will constitute the second act of a two-act performance. 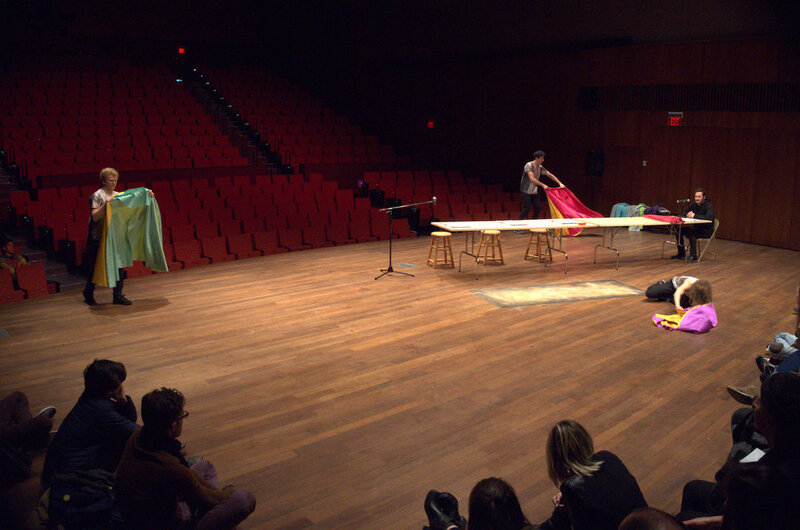 The first act will be comprised of four original solos by the participating artists. 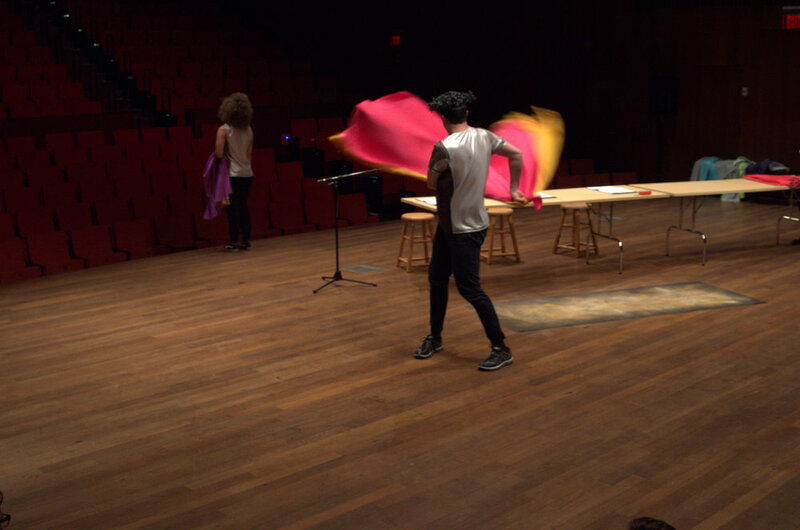 The second act is physical realization of Wright’s text, executed by the four performers from act one. Published by Every house has a door in an edition of 500 as a reading companion to The Three Matadores. Essay by Will Daddario, cover image by Kate O’Neill, designed by Jordan Williams. Further reading about Jay Wright’s poetry at the source of the Matadores performance. 40 pages. $10.00 (includes shipping in the US). is the author of two novels, Let Go and Go On and On (Curbside Splendor, 2014) and The Karaoke Singer’s Guide to Self-Defense (Featherproof Books, 2011). He has also become publisher and editor at Featherproof Books, teaches at the MFA program at Roosevelt University and work as a video editor. Since 1996 his band Joan of Arc and its related projects have released dozens of albums and they continue to tour internationally on a regular basis. Current projects include commissions for the MCA Chicago and The Museum of Contemporary Photography. and Portuguese at New York University and at the Teatro de la Universidad Católica in Peru. His writings have appeared in TDR:The Drama Review and Istmo: Revista virtual de estudios literarios y culturales centroamericanos. Most recently he contributed to the anthology Neoliberalism and Global Theaters: Performance Permutations, edited by Lara Nielsen and Patricia Ybarra (Palgrave Macmillan, 2012). His current research focuses on the role of theatricality, television, and politics in Latin America. As a performer he has collaborated with Every House Has a Door, Witness Relocation, Anna Deavere Smith, John Jesurun, Ann Carlson, Faye Driscoll, Tim Etchells and Matthew Goulish’s Institute of Failure, and the International Contemporary Ensemble, among others. is a DMV-born, Oakland-bred, Chicago-based artist, writer, and choreographer. She produces solo and collaborative work that interrogates blackness, bodies, and utopia at the limits of performance. She is a double Cancer with a moon in Taurus, and enjoys cultivating strong feelings in her home with friends. co-founded the art duo Cupola Bobber in 2000 and the electro-acoustic sound group Fessenden in 2005. His work has been shown across the US and Europe. Venue highlights include Steirischer Herbst Festival in Graz, Künsthaus Mousontrum in Frankfurt am Main, Nationaltheater Mannheim, Chelsea Theatre in London, In Between Time Festival in Bristol, Fusebox Festival in Austin, PS122 and CUE Arts Foundation in NY. He has received commissions and support for various projects from Steirischer Herbst Festival, Nationaltheatre Mannheim, In Between Time Productions, and NPN with Links Hall and PS122. He was an International Artist Fellow at Lancaster University in 2007 and awarded a MacDowell Colony residency in the summer of 2010. Most recently, Stephen has worked as a teaching artist with Brooklyn's Center For Urban Pedagogy (CUP) and was awarded a Swing Space residency by the Lower Manhattan Cultural Council. We made The Three Matadores collaboratively, staging the text from The Presentable Art of Reading Absence (Dalkey Archive, 2008) with permission and encouragement from the author Jay Wright. The development of The Three Matadores was made possible, in part, by the Maggie Allesee National Center for Choreography at Florida State University. This project was supported by the MacArthur Funds for Arts and Culture at the Richard H. Driehaus Foundation, The Poetry Foundation, Link’s Hall, City of Chicago Department of Cultural Affairs and Special Events, Sector 2337, and private donors. Thank you Shoni Currier, Jim Moore, Leigh Fagin, Erin Brenner, Ira Murfin, Carla Peterson, David Levin, Seth Bockley, William and Abrienne Schmelling, Shawn Convey, Ashley Fargnoli, Dalkey Archive Press. Special thanks to Jay and Lois Wright, Will Daddario, and taisha paggett.